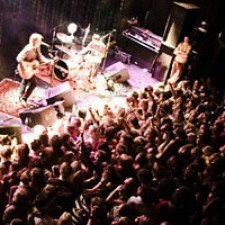 Mejeriet in Lund is a culture center that is internationally known especially for it's excellent concert venue and its versatile concert program. But the house offers more than that. There is also a theater, cinema, musical education, rehearsal rooms and more. The building's cultural span and independence gives it a special status in Sweden. Mejeriet is also a member of the European network of cultural centers in Europe, Trans Europe Halles, and hosting the network's headquarters. Plektrum: organizes concerts with jazz, world music and more. Eg the famous Jazz Brunch. RåFilm: producing film and arrange courses. Månteatern: theater for both children and adults. Sousou and Maher Cissoko started following Mejeriet. David Åhlén started following Mejeriet.